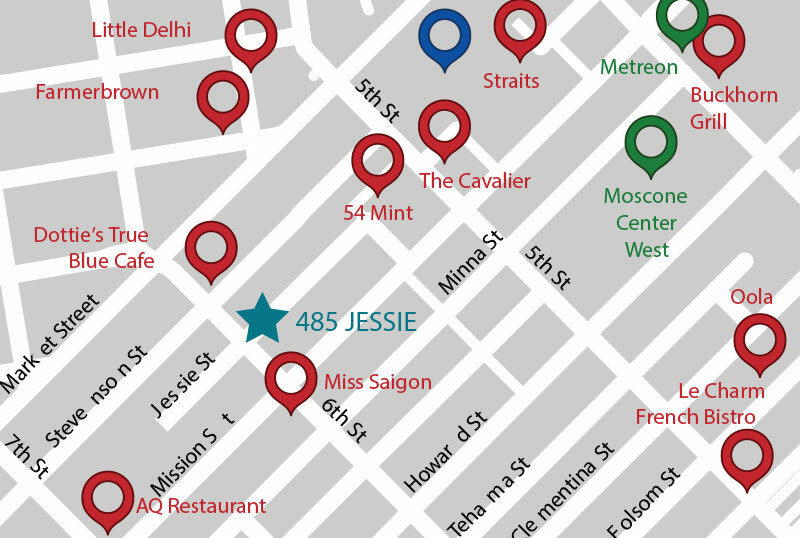 485 JESSIE STREET is a five-story plus basement, fully-renovated creative office property with ±47,067 gross square feet. On a lot size of ±7,997 square feet, its original vintage construction type provides the ideal “historic creative” feature strongly preferred by the rapidly-expanding tech and creative tenants in the area. Located on the north side of Mission Street, between Fifth and Sixth Streets, it rests close to many of SF’s most popular venues, modes of transportation, and other corporate and technology tenants. Neighboring areas include SF’s Central Business District, Civic Center District, and SOMA submarket. Vantage purchased the property in July 2013 and set out to renovate the ground floor to creative office use, as well as to convert the basement area into usable office space in connection with the ground floor. Additionally, a new entrance fronting onto Jessie Street was added for direct access to the ground floor tenant. Vantage sold its position in the property to its capital partner in November 2015.